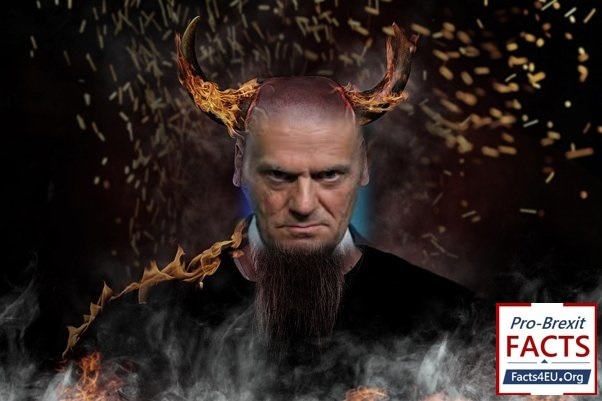 Yesterday’s ‘Brexiteers belong in Hell’ statement by the unelected president of the EU Council, Donald Tusk, was not an ‘off-the-cuff’ remark. It was scripted in advance. Not only does it appear in the official statement published by the EU Council yesterday, it carries even more weight by being the final, concluding paragraph. In addition it was tweeted by Donald Tusk’s office almost immediately. This was a deliberately hostile act, the day before the Prime Minister was due to meet him in Brussels today. Mr Tusk’s statement yesterday was the probably the worst in a long line of aggressive and hostile contributions from a wide variety of EU officials and politicians, since the British people rejected EU membership in the largest democratic act in British history. The tweeted response from Brexit Facts4EU.Org yesterday was simple. Governments - and quasi-governments such as the EU – must be judged on their words and actions. Their words alone have shown the nature of the beast, to continue the religious theme of Mr Tusk who is the former prime minister of one of the most Catholic countries in Europe. The actions of the EU have shown that they have allowed their emotional response to be translated into the worst draft international treaty in history. Until its natural rejection by the UK Parliament, a set of unelected Remainer civil servants from the UK negotiated with a set of unelected, Euro-federalist and fanatical bureaucrats in Brussels. They did so on the basis that “nothing is agreed until everything is agreed” – a tenet repeated often by the key EU individuals throughout 2017 and 2018. The EU knew that Theresa May didn’t even have an overall majority in Parliament, thanks to her disastrous election campaign of 2017. Now that it is clear that nothing is yet agreed, the sheer arrogance and hostility of the EU is being displayed openly and with no shame on their part. The world community will no doubt look at this with interest. The upside is that this can only fan the flames of anti-EU feeling amongst the British general population. In that sense, Mr Tusk, we are eternally grateful. You've confirmed, once again, why I voted Leave. No doubt you briefed our PM on the content of your speech, and she gave her approval. Followed up by Guy Verhofstadt who has said Brexiteers without a plan for leaving the EU "would even manage to divide hell. It was clear to me 2 years ago that leaving the day after the referendum with no deal was the perfect deal. Each day May drags this out with the help of her remainer civil service the weaker our position gets. If Nigel Farage had been in charge of Brexit 'negotiations' we would already be gone. Neither wisdom nor discerning communication were the kind of tools the EU ever mastered or even seemed to understand the value and power of. Despite the fact we're not expecting much from them in this area, I'm still astonished at just how deep they've allowed themselves to sink into extreme childishness. This is the last throw of the dice from the EU,to try and get a reaction.The Swedish minister Margot Wallström, Sweden's foreign minister and a former European Commission vice president condemned Brexit earlier in the week.A concerted attack on the UK, to shore up the EU's position of intransigence to proper negotiation of an exit from this cartel.As the EU gently drifts into its third economic recession in ten years the EU is terrified of Britain leaving, and being successful away from them.All that is left is to throw insults as we depart. there should be a special place in hell for unelected EU officers who have tried to frustrate every sensible plan for an orderly Brexit. Those who wished to leave the EU had plans which have been screwed up by both the EU and the idiots in Britain who want to remain under the EU jackboot. Obviously Tusk's country has done very well sucking from the EU teat and are worried about the loss of our contribution, so no wonder he is very angry at our decision to leave. We should have left stat and then negotiated from a position of strength. If you wonder about his stature as Ex-PM of Poland just recall Kings run kingdoms, dukes run duchies and countries are run by C-----s.
Agree 110% with all above comments. This was a very ill-advised intervention by the EU but Treason May will continue to grovel to the Brussels Mafia. I'm praying for 23.00 hours on 29 March to come but I have a fear that the 17.4 million who voted (probably a lot more now) will be shafted by the Westminster politicians. PS I'm wondering if Mr Fanculo is a real name, if it is its very appropriate! AS A PROUD BRIT, I DEMAND TUSK MAKES A PUBLIC APOLOGY TO OUR COUNTRY FOR HIS INSULTING WORDS AND BEHAVIOUR. Tusk shows the world what an arrogant bunch of unaccountable has-beens the EU commission are. If I were Polish, I would consider this man an embarrassment. Tusk forgets that British taxpayers are the second highest NET contributor to the EU scam, which has been referred to many times as a 'protectionist racket'. Poland is the largest NET recipient. As for Prime Minister May, it is once again clear she is pro-EU to her core, and refuses to remove the ridiculous 'back-stop'. She is selling OUR country out bit by bit. The UK WILL BE A VASSAL STATE. We WILL be governed by Brussels and have to accept EU law. We MUST keep in mind the video that came to light of Corbyn trashing the EU prior to the Irish referendum and again some years later. This is all about WHO governs Britain, and in my opinion we've reached the point where Mrs May and her supporters are effectively handing our country over to a foreign regime no-one can remove, other than by war? When elected MPs enter the House of Commons they must swear an Oath to Queen and country - they don't swear an oath to a foreign entity, nor to the Juncker elite. Prime Minister May should be considered 'hostile' to our country, as only in times of war would ANY prime minister surrender their country to a foreign power. Whether or not she's presently acting illegally is perhaps a matter for debate? I am fed up of being talked down to by the EU. They forget how they gained their freedoms decades ago. What we see is the UK PM being pushed around by the EU. Mrs May MUST walk away from the EU leaving them in no doubt we WILL move to WTO. If they want a deal, let them come to us. BUT MAKE NO MISTAKE, I'D RATHER EAT STEWED GRASS THAN BE DICTATED TO BY UNELECTED FOREIGN BUREAUCRATS. Why else is Tusk so damned angry?